Canavore Pacific Ocean Formula is formulated to meet the nutritional levels established by the AAFCO Dog Food Nutrient Profile for ALL life stages. 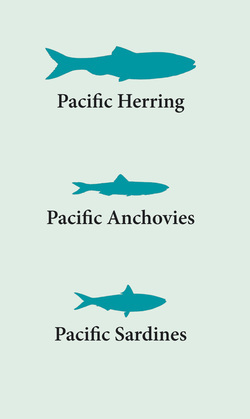 We use wild caught herring, anchovies and sardines from the Pacific Ocean. Our Pacific fish meal is made from the full fish, not stripped fish comprised of only heads and frames. Our dog food is manufactured in Canada in a special process that permits the cooked kibble to cool before adding nutrients. All this care ensures your dog gets the goodness it needs to maintain a healthy and balanced life. We are Canadian and proud to be so. We believe being Canadian speaks to the quality of care we have put into each bag of food for your dog. We hope, as a consumer, you will support Canadian made products. Our fish meal is made from ground whole fish. According to Dog Food Advisor, unlike muscle meat, which is mainly comprised of water, meat meal is very high protein and low in water. Canavores' Pacific Ocean Formula chooses wild caught oily Pacific Ocean fish rich in Omega 3 fatty acids. Sardines are chock full of Vitamin D and Calcium, while herring and anchovies add selenium, iron, phosphorous, and Vitamins such as Niacin, Riboflavin, B12, Vitamin A, E, C and K. Our fish meal just packs a lot of goodness. Canavores' Pacific Ocean Formula dog food is grain free and gluten free. We meet AAFCO's standard for Dog Food Nutrient meaning our kibble is considered complete nutrition for your dog. The limited ingredients of this food may help your dog with food sensitivities. Canavores' Pacific Ocean Formula is intended for all breeds and all ages. Check our feeding guide for advice on how much to feed to your dog. We formulated this dog food to bring shine, health and well being to your four-legged best friend.